Bicycle side cars looks and seems to be a great idea. Reading though the comment section though brings up some interesting logistical questions that I would want some answers to. 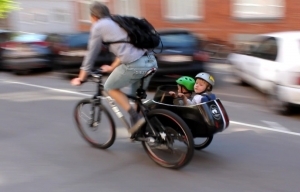 Overall though I think it looks trick and would be a great addition to any family's modal transportation plan. Not having young children anymore, I would love to see an adult sidecar version!